I hate Halloween. There. I said it. Now, I don’t want my hate for the holiday to translate into I hate the season. I LOVE October. I love Fall. I love pumpkins, and apples, and of course candy! What I hate is costumes. I hate the pressure of making or buying costumes. Especially since my children change their mind from one day to the next. And just when you pin down what they want to be, in the middle of shopping, they change their minds. I’m happy to report though, I am down to only 3 trick or treaters, the oldest is out now. And Alyssa, she does her own costume. She is stealing the idea from a friend (NATASHA!!!) who did this several years ago…”smarty pants.” If you know Alyssa, it fits. So she has a cheap-o pair of sweats that she is hot gluing “smarties”, and she is wearing nerd glasses. Ha! Perfect. However, the youngest two are more involved. It occurred to me on Wednesday morning that I needed to get on this whole costume thing. After all, they need to wear costumes TODAY for school. That’s less than a 48 hour time frame I had to make the costumes. But, no fear, after hours of hot gluing fabric to thermal underwear, we have a mummy. And after hot gluing bandanas to a flannel and jean with tons of hay, we have a scarecrow. Now will somebody please clean my house…I’m finding hay everywhere! On to the pretzels. 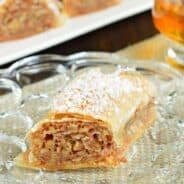 Totally fun treat you can make to surprise anyone this Halloween. Go with whatever design you like! To make spider webs, first lay out a sheet of parchment paper or a silpat (that’s what I used). Put melted white candy coating into a ziploc bag. Snip a tiny corner off the end of the bag. First draw your lines (I made a plus sign, then an X). Once your lines are drawn, swoop two circles, an inner circle of web, and an outer circle. I had to do this several times until I figured out how to swoop the circle best. Don’t snip your corner too thin, you want the web to be sturdy. In a separate bag, put melted chocolate candy coating. Draw a circle (a little smaller than an M&M) with 8 legs. Squish the M&M candy in the center. 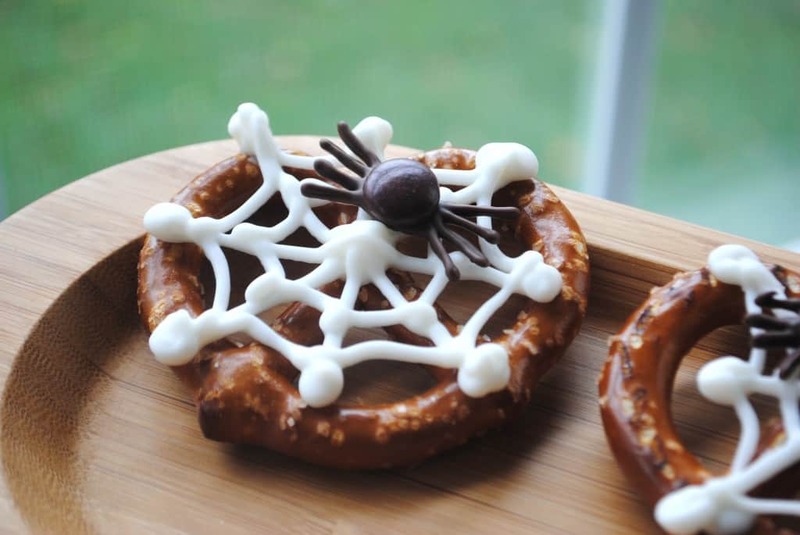 After webs and spiders harden, use melted chocolate to attach to pretzels. 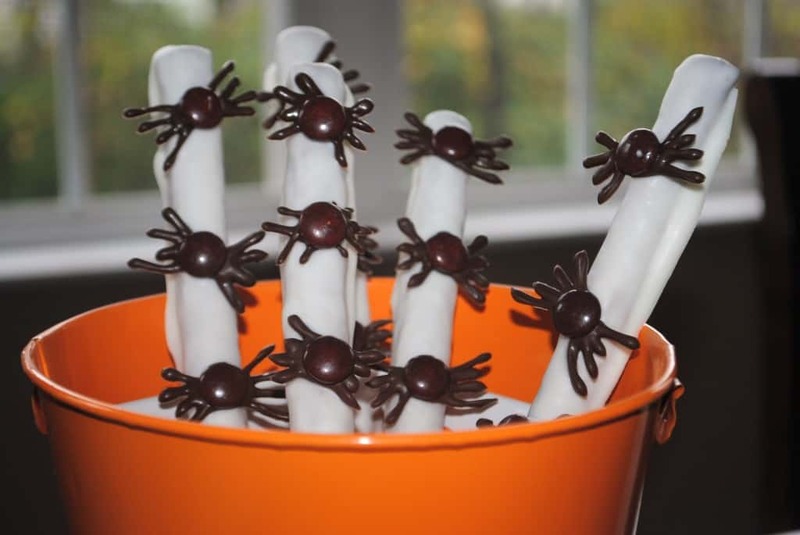 If making the pretzel rods, dip in white chocolate, and attach the spider before chocolate hardens on the stick. Dip leftover pretzels in leftover chocolate and cover in sprinkles! I’m thankful that my kids are still young so I can do most of the costume choosing 🙂 Love those webs on the pretzels! I love chocolate covered pretzels, yours look fabulous! These are just the cutest thing! Great idea! 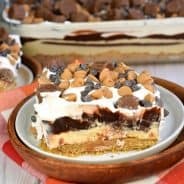 These Halloween treats look great! 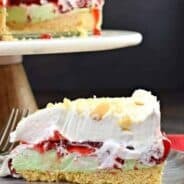 Looks fun and delicious! How cute are these! I like spiders made out if chocolate and m&ms;). Another fab treat girl!!! I love this, I was planning on making chocolate covered pretzels today!! So simple and so delish! I love sweet and salty together!! Love! I saw you on Sweets on Saturday! Please join me on Thursday’s Treasures. <3 and Hugs! OH, I love these. Especially the spider web. Such a great idea! Thanks for sharing on Sweet Indulgences Sunday. Finally! Someone else who despises the pressure of costume-choosing!